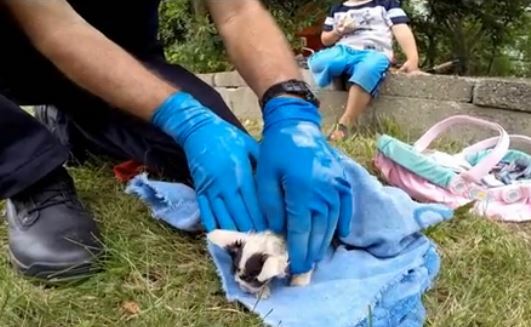 A GoPro camera captured the drama as firefighters rescued two tiny kittens on Sunday. One of the babies had to be revived with CPR at the scene. Firefighters from Shift 3 of the City of Athens Fire Department in Athens, Ohio responded to a call about a kitten trapped down a narrow pipe underground on Sunday and rescued what turned out to be two kittens instead of one. The first kitten was brought up from an extremely narrow space and then warmed and dried. Then a second kitten was heard meowing and was brought up through a larger sewer pipe opening. The crew had to use water to help move the second kitten toward the opening. The second kitten looked very weak and was having trouble breathing so Lt. Doug Ford used CPR compression to get the kitten breathing again. Firefighter and photographer Sean Dean often brings his GoPro camera on calls and films any interesting events on the job. “Typically we don’t do cat rescues from trees, but these two kittens were in a special situation,” Cpt. Kenny Gilbraith told the paper. The fire crew was happy to help the kittens and to put their confined space training and equipment to use. Sean Dean says he hopes his videos show people what firefighters do and why they are committed to their work. An adult cat that appears to be the Mama appears toward the end of the rescue video and checks on one of the kittens before a little girl carries it, wrapped in a blanket and nestled into a small box, into the house. Firefighters are the best, they don’t just save people’s lives but even animal’s lives. GOD BLESS YOU!! !